Brandy Tjungurrayi was born in the bush, probably near Jupiter Well, around 1930. As a senior and knowledgable lawman, he paints stories - mainly Tingari Cycle stories and Emu Dreaming stories - connected to his home country around Nyilla (Jupiter Well). Formally, his paintings are elegant, linear compositions comprised of fine dotting run together to create lines, often broadly symmetrical and sometimes converging on a central point in the canvas. Brandy started painting in 1985 at Balgo but also spends time painting at the community of Kiwirrkura, where many of his relatives live. His work is diverse in composition and reflects at times the painting styles and palette of both communities. 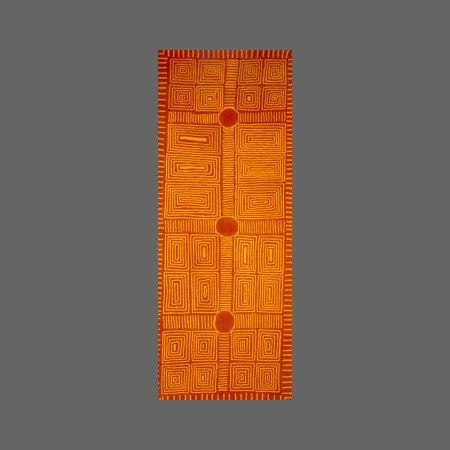 He had his first solo exhibition with William Mora Aboriginal Art in 2000 and he participated in the Kiwirrkura Men's Painting exhibited at the acclaimed Papunya Tula retrospective at the Art Gallery of NSW in 2000.